1749 Vaugondy Map of Madagascar ADDITIONAL IMAGES AVAILABLE ON REQUEST WE SELL ONLY ORIGINAL ANTIQUE MAPS - NOT REPRODUCTIONS. 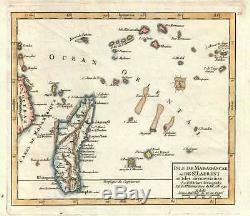 Title: Isle du Madagascar ou de St.
Robert de Vaugondy Fils de Mr. Description: This is a hand colored 1749 Didier Robert de Vaugondy map of Madagascar. The map depicts from the islands of Zanzibar and Pemba and the African coast (Zanguebar), across Madagascar to Diego Garcia and from the Seychelles to Madagascar and the Tropic of Cancer. Madagascar is presented in detail, labeling rivers, points along the coast, and Antananarivo (Antavare), the capital city. This map was published by Gilles Robert de Vaugondy in his Atlas Universel, Portatif et Militaire in the 1749 edition. Size: Printed area measures 6.5 inches high by 7.5 inches wide. Slight loss along bottom margin. If your address is a P.
We can use your Federal Express Account. Duty varies by country and we cannot predict the amount you will be charged. Some countries are duty free, others are not. Other Services Conservation Framing: Geographicus recommends basic conservation framing services for any antique paper. We do not offer this service. Antique Map Restoration: Geographicus can repair and restore your antique map. Services include deacidification cleaning flattening and backing. The item "1749 Vaugondy Map of Madagascar" is in sale since Friday, January 4, 2019. This item is in the category "Antiques\Maps, Atlases & Globes\Africa Maps".